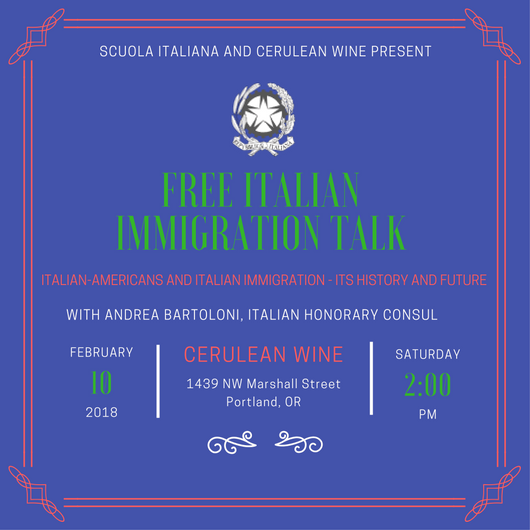 The Italian Honorary Consulate will provide a free discussion on February 10, 2018 at 2 p.m. at the Cerulean Wine Bar, 1439 NW Marshall Street. The talk will introduce you to Italian immigration in America, how an Italian-American can claim Italian citizenship, and how Americans can live or stay for extended periods in Italy. Please join us to drink some lovely local wine and take a fascinating journey through the history and practical aspects of navigating the intricate world of Italian immigration and emigration today. Please email info@scuola.us with any questions.